This post is about a different type of ant, far worse than the insect—it is the Automatic Negative Thoughts (ANTs) that invade workers minds throughout the day. How many times have you heard someone say? Maybe you heard them say it once. Can you imagine someone running that phrase through their mind multiple times a day like a continuous loop? I get exhausted just knowing there are people living like this day after day. Unfortunately, there is a free-floating anxiety, permeating Corporate America. Employees don’t feel empowered, morale plummets and the workplace becomes toxic. For individuals, ANTs result in missed career opportunities, lower confidence, low productivity and research by Mark George, MD, National Institutes of Health reports negative thoughts inflamed brain areas often involved with depression and anxiety. None of this exactly sounds quite like a Pep Talk, so let’s figure out how to exterminate the ANTs. Here are four tips to help your friends, relatives or co-workers when you notice ANTs creeping into the conversation. If you know of any other anti-ANT strategies, please leave them as a comment to this post. (1) Remember ANTs are automatic, so when someone has an infestation the first step is the let them know, these pests can be eradicated. ANTs have to be acknowledged. They can be written down in a notebook or if that’s not convenient, suggest they repeat ANTs into a voice recorder on their cell phone. Make note of what situation or who around them brought the ANTs. In the future, they can limit interactions with the person or people who inspire ANTs and avoid situations that result in ANTs. (2) When ANTs emerge, suggest your co-worker ask a series of questions beginning with—is that negative thought true? How can they be sure? Have they ever faced and overcome a situation like this before? Are they likely to be able to succeed again? (3) Toxic workplaces foster environments that minimize what their employees do right and anything workers do wrong is turned into a disaster. With this in mind, remind your relative that while the workplace may be filled with ANTs; they do not have to bring them home. Flood their work areas with positive affirmations (their screen saver, their mouse pad, the pictures on the wall, etc.). (4) ANTs instill fear. Working in fear is an enormous waste of time, lowers productivity and keeps employees from their personal best. Someone came up with a great acronym for fear: False Evidence Appearing Real. (Feel free to borrow and share). The ANTs didn’t show up over night and workers can’t expect to rid themselves of this problem in a day or two. 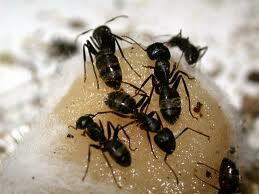 If ANTs are persistent they could be part of social anxiety disorder or other issue that requires professional help. A company’s Employee Assistance Plan (EAP) is a good (free) place to start and there are many health care professionals and career coaches equipped to help employees exterminate their ANTs once and for all. Help everyone you know exterminate their ANTs and have a great week! I've struggled with an ANT problem since growing up in a very strict demanding household. Nothing we did was ever good enough. Now in my 40s in my career I have a hard time getting my work done on time because I am a perfectionist and my supervisor said I was a martyr because I work long hours. I review everything a million times and struggle deciding when good is good enough. I've been working on this and does take time. Children can also have ants. My grandchildren 17, 14 and now I'm even noticing the 8 year old are always talking about failing tests or striking out in baseball. I printed this post out and shared it with my daughter in law because she's mentioned how much peer pressure kids have these days. Your readers should think of their children's ants too. That's a very clever of you. A fan in Memphis. I have the opposite problems my employees don't have ants they must have apt. I work with a group of younger 30-something men that think all women they talk to want to sleep with them even when they talk on the phone to them. They also always over forecast on sales. I work in the wireless industry. Talk about automatic positive thoughts our sales center seems like I am managing a frat house.